Mangaluru: Three youth have been arrested by the Pandeshwar police and personnel of anti-rowdy squad south in connection with threatening, snatching mobile phone and cash from Srinivas, police constable of Armed Reserve Police Force near Nehru Maidan in the city. 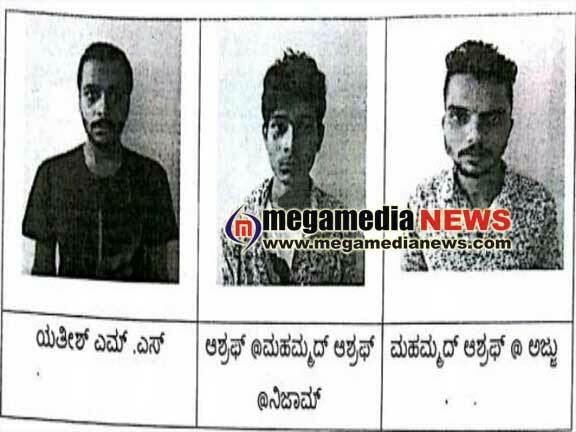 The arrested have been identified as Ashraf alias Mohammed Ashraf alias Nizam (21), a resident of Sarapadi Ajilamogaru in Bantwal and Yathish M S alias Yati (22) and Mohammed Ashraf alias Ajju (23), both residents of Chikkamagalur. Three months ago, the constable Srinivas was going through the lane inside Nehru Maidan in the night when three strangers waylaid him , snatched his mobile and stole Rs 450 cash from his wallet. A case was registered in this regard in the Pandeshwar police station. When the accused were nabbed by the cops and subjected to interrogation it was learnt that Yatish M S, the main accused in this case is a notorious thief. He along with his accomplice Ravi alias Shankarlingegowda was involved in chain snatching and stealing of two-wheelers in and around Bengaluru. The police have seized the stolen mobiles from the accused and it is learnt that the accused used to loaf around Nehru Maidan.